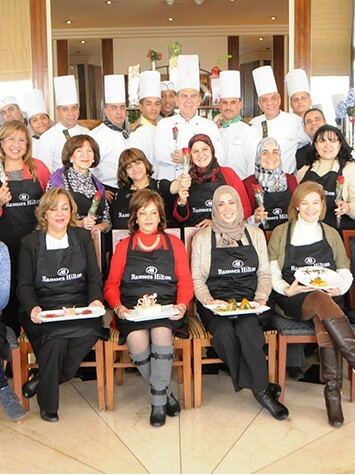 Ramses Hilton celebrated this Valentine’s Day with a delicious event. A cooking class was demonstrated by Chef Dimitrios. The Executive Chef held a culinary demonstration at the Windows on the World rooftop restaurant. The select group of lucky ladies were taught how to cook a complete Valentine’s Day set menu. The delicious menu included certified sustainable sea scallops as a starter, milk fed veal medallion as a main course ended by a white chocolate and raspberry parfait for dessert.